MATURE SCHUUR: BETTER THAN EVER! 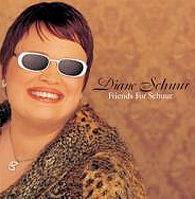 On June 10, 2014, multi-Grammy Award and legendary jazz vocalist, Diane Schuur, releases a stunning new recording I Remember You (With Love To Stan and Frank). Accompanied by an All-Star Band featuring: Alan Broadbent, Ben Wolfe, Ulysses Owens Jr., Joel Frahm, Romero Lubambo, and Roni Ben-Hur, she pays homage to two of her most important mentors Stan Getz and Frank Sinatra with 12 songs previously recorded by them. The release also commemorates her "official" discovery 35 years ago by Stan Getz at the 1979 Monterey Jazz Festival. On June 10, 2014, be a witness--to a new dimension and brilliance of 'the Deeds!" AUDIOPHILE AUDITION: "The whole production is a winner!" The Gathering, is unique in both material and style, and features special guests Alison Krauss, Vince Gill, Mark Knopfler, Larry Carlton and Kirk Whalum. 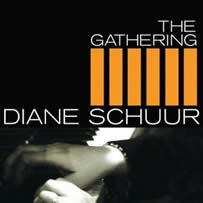 The Gathering is a collection of 10 classic country songs, mostly written during the golden era of the 1960s, and is the first time Schuur has featured this genre of music. On selections like Willie Nelson's 'Healing Hands of Time,' Roger Miller's 'When Two Worlds Collide,' Merle Haggard's 'Today I Started Loving You Again' and Tammy Wynette's 'Til I Can Make It on My Own,' Schuur's great vocal versatility shines through. 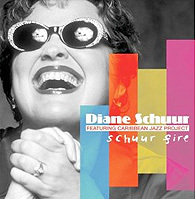 The Very Best of Diane Schuur is a fine collection of thirteen of Diane Schuur's most popular recordings, featuring such tracks as "All Right, OK, You Win (I'm in Love With You)," "Try a Little Tenderness," "Sunday Kind of Love," "Deed I Do," "Time for Love," "'Round Midnight," "Stormy Monday Blues," "Deedles' Blues," and "New York State of Mind." 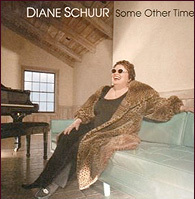 "Some Other Time," vocalist and pianist Diane Schuur's February 2008 Concord release, is a recording of songs by jazz artists whom she first discovered via her parents during her childhood and adolescent years. The album features songs by George and Ira Gershwin, Irving Berlin, Sammy Cahn, Rodgers and Hammerstein and more. The set also includes a surprisingly mature-sounding rendition of "September in the Rain," recorded at the Holiday Inn in Tacoma in 1964 when Schuur was only ten years old. "Some Other Time" is, among other things, Schuur's celebration of the music of her parents' generation, and a tribute to her late mother on the fortieth anniversary of her death at the young age of 31. For her third release on the Concord label she revels in late night moods and matters. 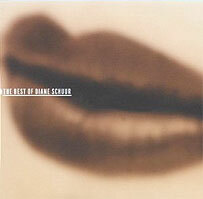 The album's thirteen songs were written specifically for Schuur by Barry Manilow, who also co-produced the set. 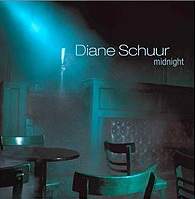 With a voice of remarkable tonal clarity, unbridled swing and enviable range, vocal diva Diane Schuur displays, in Swingin’ For Schuur, all of the qualities that have made her one the greatest living jazz vocalists. And speaking of enviable range, trumpet king Maynard Ferguson has long been revered for his stratospheric trumpet flights, not to mention his inimitable vibrant and powerful sound. Here, in their first recording together, both artists hold nothing back. 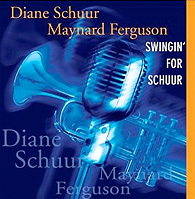 With lively support from Maynard’s Big Bop Nouveau band, Diane Schuur and Maynard Ferguson form a potent, combustible combination that’s Swingin’ for Schuur! Enlisting the songwriting talents and/or performances from some very special friends - including Ray Charles, Alan Bergman, Stephen Bishop, Alan Broadbent, (a digitally reintroduced) Stan Getz, Dave Grusin, Gloria Estefan, Stevie Wonder - and the help of producer Phil Ramone, DIANE SCHUUR delivers Friends for Schuur-a star-studded, dynamic and eclectic album that magnificently showcases her multi-faceted, one-of-a-kind vocal artistry.